I have been recently wanting to update the lore behind my dragons and make them more united in cause. I thought what better way than play off the nice columns laying around my lair and the coliseum I've been training in than make my lair based off of a Roman Legion/Cohort. So, I found a handy wikipedia page that listed a bunch of names for roman units in their Legion and found the ranks that would best suit their role in the clan. While my den can't nearly hold as many troops as found in a real life cohort did, I think this will turn out well. The latin word for light as the name of the empire, as the "Light Empire", while grand by itself doesn't fit well with all the Roman stuff. The "Lux Empire" sounds so much more...different? I don't know. Hopefully I can figure something out for my dragons' descriptions, their rank should be displayed proudly. I'll be using this page to post any inspired lore I figure out for my lair. Also, it will give me a chance to learn BBCode so I can make my posts all fancy~ If anyone has tips for the layout, feel free to say them! [center][img]http://www1.flightrising.com/static/layout/revamp/banners/light_small.png[/img][/center] [center][color=#E8A12F][b]The Lux Empire Legion[/b][/color][/center] [color=#CCAF29] [center][color=#DAA520]Imperator Scarivana[/color] [url=http://flightrising.com/main.php?dragon=15116090] [img]http://flightrising.com/rendern/350/151161/15116090_350.png[/img] [/url][/center] The First Imperator of the 175391st Cohort stood proudly on the hilltop above her troops. Her mate and Second Imperator, Ajrion, stood with her. While much smaller than most of their troops, they had shown their leadership and intelligence more than once in the Great Struggle. “Ajrion,” Scarivana addressed. “Do you think they are ready for what comes next?” “Not quite yet, my dear,” he responded, ringing dully with worry. His voice still had not adjusted for the monotone of the Fae breed, but she admired his willingness to keep trying for that effect. “Then we must keep training. Pandora and Isaprania will train all to at least adeptness in the art of battle. We are well stocked with supplies, yes?” “The recent report from Ebrilla stated that our hoard is bursting with food. Our warriors have done well.” “Of course they have, they were brought into this Cohort by me, were they not?” Scarivana let a sliver of her vainity show. She was very proud of how well her small clan- no Cohort- had come since its first baby steps. Her sharp yellow eyes caught a glance of light shining off of a Legionary’s scales. “We will have to have them outfitted anew with armor. Bare scales are not fit for a cohort of the Grand Praetor.” The thought of one of her troops being wounded where a metal or spell could have protected made her wings twitch. “But where will we find such treasure enough to outfit those without?” Scarivana thought on this question in silence. She traced the incoming path of her best warriors as they flew in from the coliseum. Where indeed. The First Imperator of the 175391st Cohort stood proudly on the hilltop above her troops. Her mate and Second Imperator, Ajrion, stood with her. While much smaller than most of their troops, they had shown their leadership and intelligence more than once in the Great Struggle. “Not quite yet, my dear,” he responded, ringing dully with worry. His voice still had not adjusted for the monotone of the Fae breed, but she admired his willingness to keep trying for that effect. “Of course they have, they were brought into this Cohort by me, were they not?” Scarivana let a sliver of her vainity show. She was very proud of how well her small clan- no Cohort- had come since its first baby steps. Her sharp yellow eyes caught a glance of light shining off of a Legionary’s scales. “We will have to have them outfitted anew with armor. Bare scales are not fit for a cohort of the Grand Praetor.” The thought of one of her troops being wounded where a metal or spell could have protected made her wings twitch. Scarivana thought on this question in silence. She traced the incoming path of her best warriors as they flew in from the coliseum. Where indeed. [center][img]http://www1.flightrising.com/static/layout/revamp/banners/light_small.png[/img][/center] [center][color=#E8A12F][b]The Lux Empire Legion[/b][/color][/center] [color=#CCAF29] [center][color=#DAA520]Lieutenant Isaprania[/color] [url=http://flightrising.com/main.php?dragon=15025215] [img]http://flightrising.com/rendern/350/150253/15025215_350.png[/img] [/url] [/center] Lieutenant Isaprania paced behind her trainees in annoyance. A slipup here, a missed scratch there. They were not battle ready at all. She silently cursed her Imperator for her newly imposed rule that all dragons in the cohort be trained to a level that her greatness deemed high enough. Which meant training her clanmates like Hastatus, fodder. Without missing a beat, the Lieutenant straightened the stance of Ventulus Neofelia. If any dragon was not fit for battle, it was this orange nocturne. Isaprania made eye contact with her prodigy, Glamaline, across the field where the trainees were practicing. The odd dragon was seemingly unbothered by the strange growths that had appeared on her hide months ago. She was showing a much larger imperial a special move called slash, which helped weaken an enemy by bleeding them out. Isaprania looked away and snarled in disgust, none of these trainees were ready for the real coliseum. Few could even muster the strength to use their element! 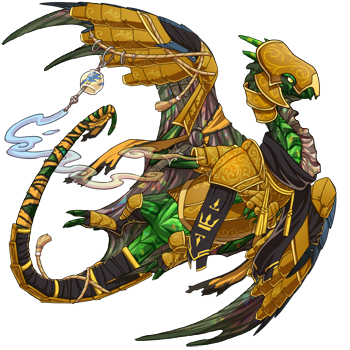 These dragons were not fodder, nor were they trainers like herself, Legate Pandora, or Flamen Glamaline. What made it worse was the silly outfits many of them wore. One imperial was dressed in silly form-fitting clothing and snuck around the camp like a dragon four times smaller in size. Warriors, they were not, but she had to do her duty to her cohort, to her clan. She would make these wimps the warriors Scarivana wanted, however she could. Lieutenant Isaprania paced behind her trainees in annoyance. A slipup here, a missed scratch there. They were not battle ready at all. She silently cursed her Imperator for her newly imposed rule that all dragons in the cohort be trained to a level that her greatness deemed high enough. Which meant training her clanmates like Hastatus, fodder. Without missing a beat, the Lieutenant straightened the stance of Ventulus Neofelia. If any dragon was not fit for battle, it was this orange nocturne. Isaprania made eye contact with her prodigy, Glamaline, across the field where the trainees were practicing. The odd dragon was seemingly unbothered by the strange growths that had appeared on her hide months ago. She was showing a much larger imperial a special move called slash, which helped weaken an enemy by bleeding them out. Isaprania looked away and snarled in disgust, none of these trainees were ready for the real coliseum. Few could even muster the strength to use their element! These dragons were not fodder, nor were they trainers like herself, Legate Pandora, or Flamen Glamaline. What made it worse was the silly outfits many of them wore. One imperial was dressed in silly form-fitting clothing and snuck around the camp like a dragon four times smaller in size. Warriors, they were not, but she had to do her duty to her cohort, to her clan. She would make these wimps the warriors Scarivana wanted, however she could. [center][img]http://www1.flightrising.com/static/layout/revamp/banners/light_small.png[/img][/center] [center][color=#E8A12F][b]The Lux Empire Legion[/b][/color][/center] [center][color=#800000]Flamen Glamaline[/color] [url=http://flightrising.com/main.php?dragon=16362487] [img]http://flightrising.com/rendern/350/163625/16362487_350.png[/img] [/url][/center] The warrior Glamaline carefully noted down the progress of her clanmates. Many were coming along quite nicely, enough to last a few rounds in the training grounds on their own. But a few of the dragons simply had no ferocity in their bones. 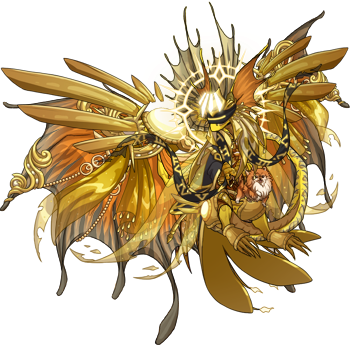 [center][color=#DAA520]Speculatore Lavalindia[/color] [url=http://flightrising.com/main.php?dragon=24355599] [img]http://flightrising.com/rendern/350/243556/24355599_350.png[/img] [/url][/center] A couple feathers twitched on Glamaline's wing in the wind as a gust of air was swept up. The newcomer Skydancer, Lavalindia, landed gracefully as all Skydancers do. She hesitated slightly, sensing the Nocturne's annoyance. "What is it, Speculatore Lavalindia?" said the Flamen with a snap of her tail. "I came to report in from my scouting mission. We are nearing the den of the monsterous Roc, to the North of the Cohort," Lavalindia said. "A Roc? Hm. Bring me Isaprania and Pandora, we will need to vanquish this threat to the clan as soon as possible." "Yes, Flamen Glamaline," the Skydancer said demurely before taking off in the direction of the training fields where Isaprania was currently testing some new fodder. The wind had taken on the smell of rot, Glamaline noticed. She turned her head at first West, to the direction of her Plague homeland, but this smell was much closer. She turned then to the North in time to see a bird as large as a dragon land on the topmost peak of a Harpy Roost. It was time, then, for battle. The warrior Glamaline carefully noted down the progress of her clanmates. Many were coming along quite nicely, enough to last a few rounds in the training grounds on their own. But a few of the dragons simply had no ferocity in their bones. A couple feathers twitched on Glamaline's wing in the wind as a gust of air was swept up. The newcomer Skydancer, Lavalindia, landed gracefully as all Skydancers do. She hesitated slightly, sensing the Nocturne's annoyance. "What is it, Speculatore Lavalindia?" said the Flamen with a snap of her tail. "I came to report in from my scouting mission. We are nearing the den of the monsterous Roc, to the North of the Cohort," Lavalindia said. "A Roc? Hm. Bring me Isaprania and Pandora, we will need to vanquish this threat to the clan as soon as possible." "Yes, Flamen Glamaline," the Skydancer said demurely before taking off in the direction of the training fields where Isaprania was currently testing some new fodder. The wind had taken on the smell of rot, Glamaline noticed. She turned her head at first West, to the direction of her Plague homeland, but this smell was much closer. She turned then to the North in time to see a bird as large as a dragon land on the topmost peak of a Harpy Roost. It was time, then, for battle.